Brainy Eco is equipped with ATC technology. Temperature can have major effects on the battery life of an inverter. During winters, the electrolyte contracts, that means Specific Gravity increases, so the boost charging voltage has to be increased. During summers, the electrolyte of the battery becomes more fluid, which means that the Specific Gravity decreases so the boost charging voltage has to be decreased. This is done through the smart ATC feature in Sukam's Brainy Eco inverter. It can increase the battery life up to 6 months. To ensure that the inverter and the battery work efficiently, Brainy Eco has an inbuilt back feed protection feature. This keeps the battery safe from any damage and also stops the back flow of the voltage that keeps the battery unharmed. The amazing Automatic Bypass feature in Brainy Eco ensures that even after any internal problem in UPS, the inverter turns on the load bypassing the Mains without any glitches. Wiring is no longer a worry too and thus, the customer needs not to be dependent on any electrician for the basic repairs. Intelligent customers choose an intelligent inverter. For the first time in India, Brainy Eco comes with a unique charge sharing feature. This means that it sends out the right amount of charge to the battery so that it can work efficiently and stay protected. Now with Brainy Eco, the customer has an upper hand and can choose what he needs. The customer can now select if he wants to charge the inverter through the grid or not just with the help of a small switch. This comes across as the most important feature of Brainy Eco. This home UPS gives priority to solar for charging. During day time, you can charge the battery through solar panels and even run your load. This saves the electricity, and reduces your electricity bills. Brainy Eco protects itself against high current too. This means that when the current passed in the system crosses the default limit, the LED blinks and the charging stops ensuring that the system stays protected. The system restarts properly after 5 minutes. Brainy Eco protects itself against high voltage too. This means that when the voltage (from the solar panels) in the system is detected to be more than the set voltage, the LED blinks and the charging immediately stops ensuring that the system stays protected. The system starts working properly when the voltage reaches the set voltage. Brainy Eco has a PV Reverse Protection feature. This protection makes sure that even if the solar panel wires are by mistake reversely connected, the system stays unharmed. Once the wiring is corrected, the system starts working automatically and thus, stays safe against any probable damages. 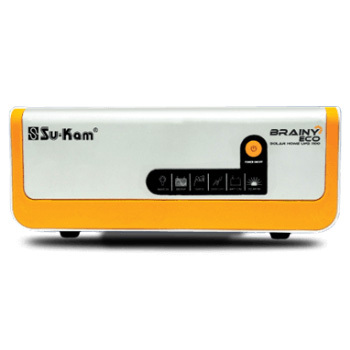 Ever heard of an inverter that stays unharmed even in case of a short circuit? Yes, Brainy Eco is protected against almost all harms, one of them being short circuits. Once the short circuit is repaired, the system starts working like before. Now you can customize the inverter options suiting your requirements. You can choose when you want to switch to grid charging to get the best power back up solutions. Solar Priority is usually selected where power cuts are less. It is fully cost efficient as it is a hybrid home UPS. With solar panels, Brainy Eco can generate electricity through the renewable source of energy, that is, the sun. Therefore, the electricity bill are highly reduced. Lastly, Brainy Eco looks super stylish and classy. Its bright color makes it stand out and it would look beautiful placed in the corner of your home.